After installing Microsoft Hyper-V Server 2012 the next thing to do is to configure it, I have already changed the name of my Hyper-V server now it’s time to set it’s Network Settings and join it to my existing domain which is jdeployment.com. 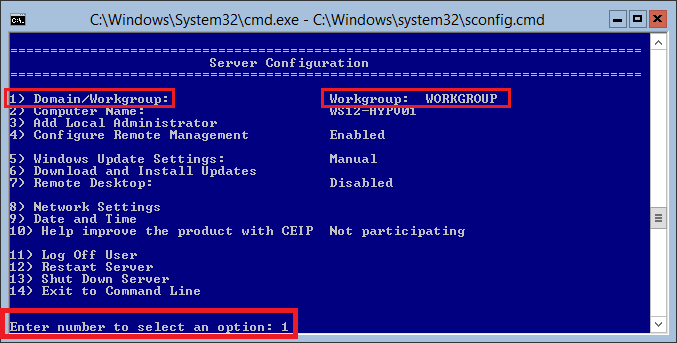 In Server Configuration select option 8. 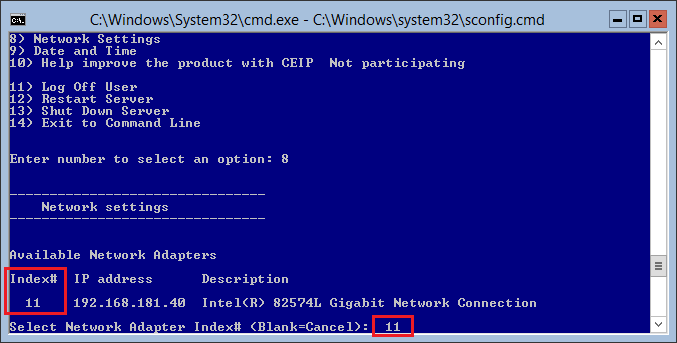 Select the Network Adapter that you want to change settings, in this example index# 11 is selected. 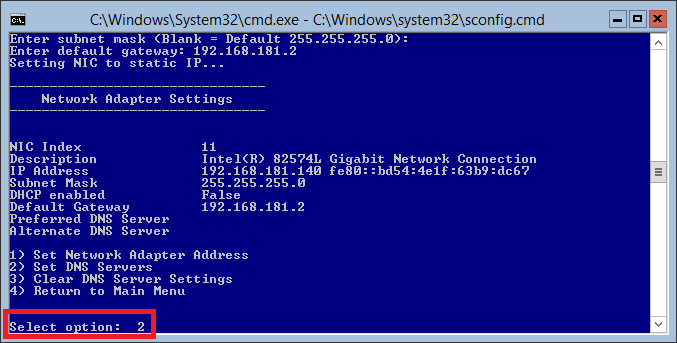 Now we will change the IP address from 192.168.181.40 to 192.168.181.140. 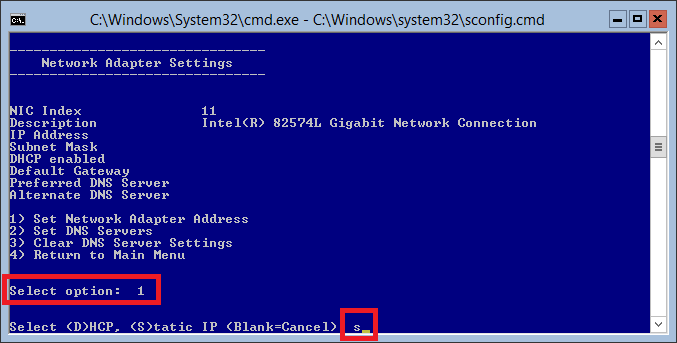 To set the network adapter address select option 1 and then type S to set a static IP Address. 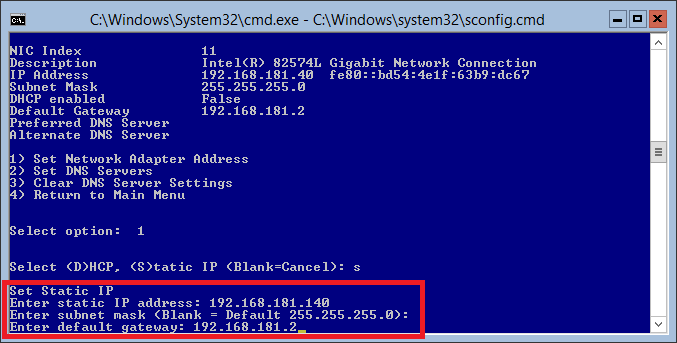 Set the subnet mask and default gateway, once done the new details will be displayed. 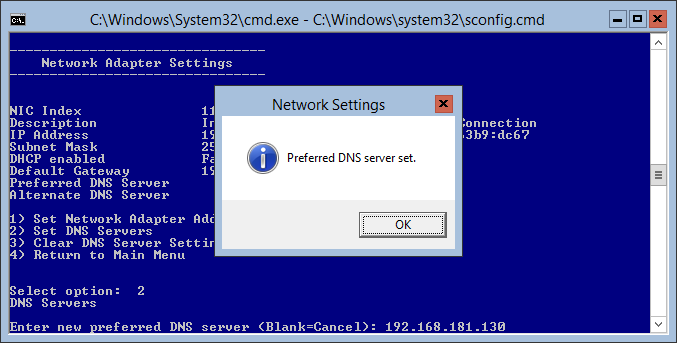 Now we need to set the DNS sever, select option 2. 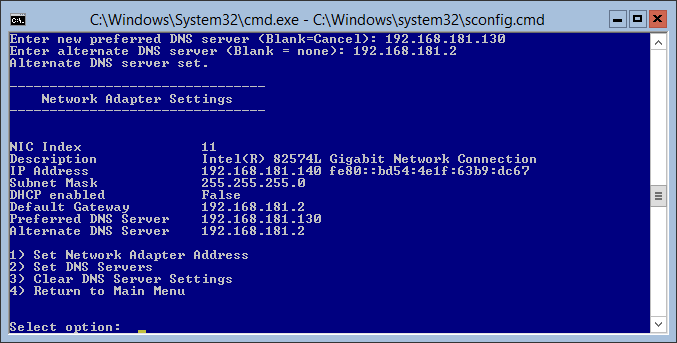 And enter the DNS IP Address192.168.181.130. A pop-u box will appear to confirm that the preferred DNS server is set, click OK. After that it will ask you to enter an alternate DNS server, if you have one, just repeat the step and you’re done. 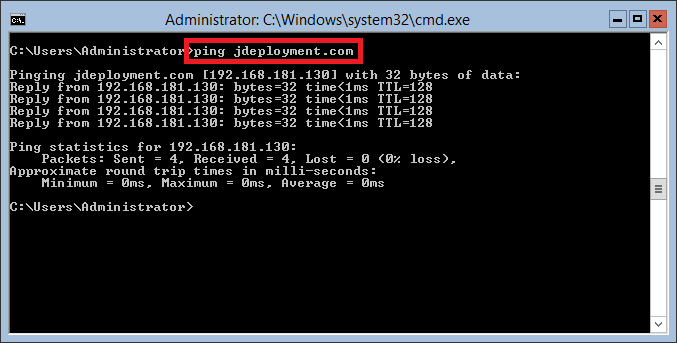 Your DNS server setting changes will reflect in the Network Adapter Settings information, verify that that DNS is working by making a ping command. 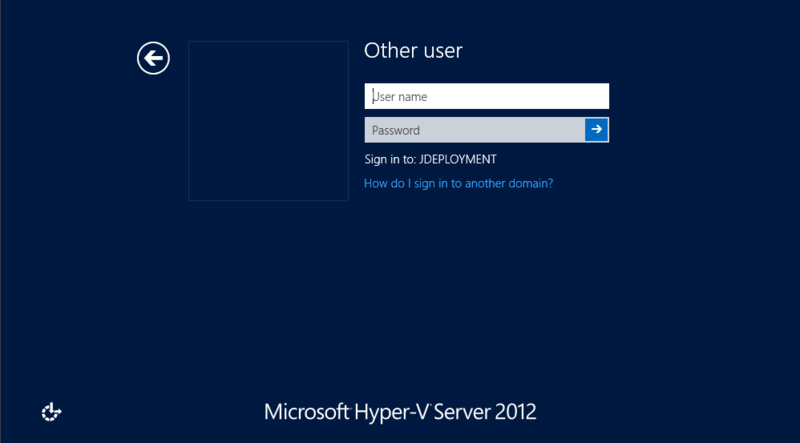 Once verified, we are now ready to join our Hyper-V Server 2012 to the domain. Back in the Main Menu, examine our server’s membership, it is currently belong to a workgroup. 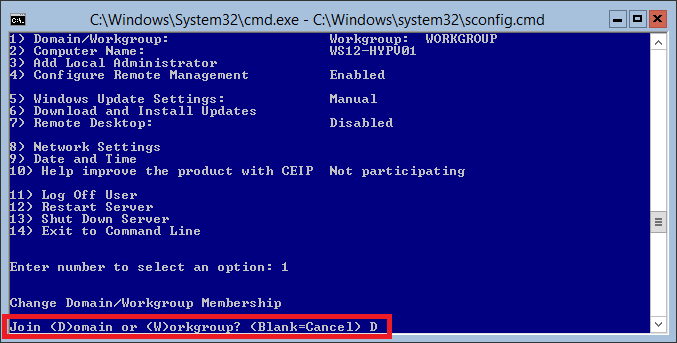 To change its domain/workgroup membership select option 1. 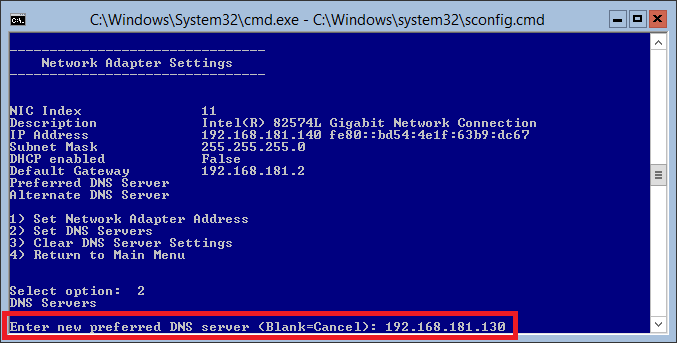 Select D to join domain. 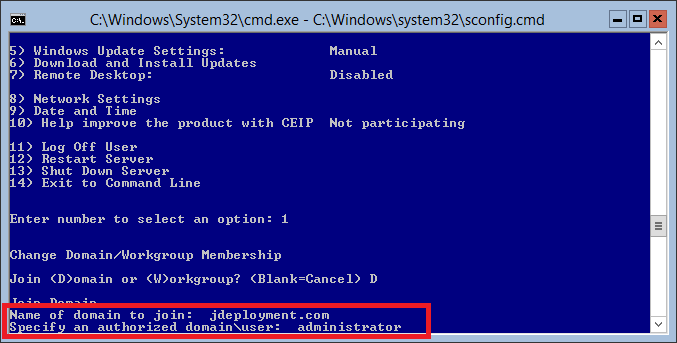 Enter the name of the domain and specify an authorized user to add the server to the domain. 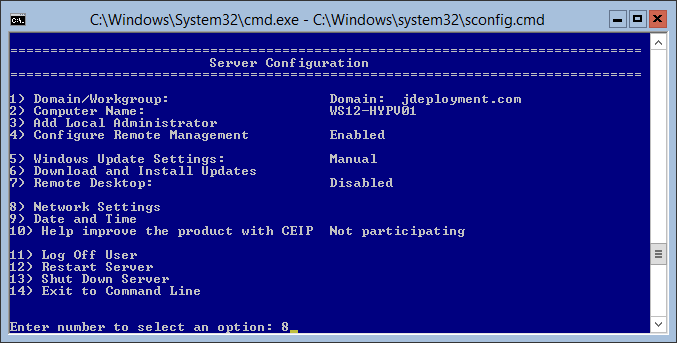 In this example, we will join our Hyper-V server to jdeployment.com and use the administrator account to join it. The netdom window will prompt you to enter the administrator’s password. A pop-up will ask if you want to change the computer name before restarting the computer, in this case, I already set my server’s name earlier so I will select No. Back in the Main Menu, verify that the server is now joined to jdeployment.com. Restart the server and try log in. sbconfig.vbs(696, 21) SWbemObjectEx: Invalid index. I have three Hyper-v servers and they all do the same thing. How can I change the address? This resolved the same issue I was having. 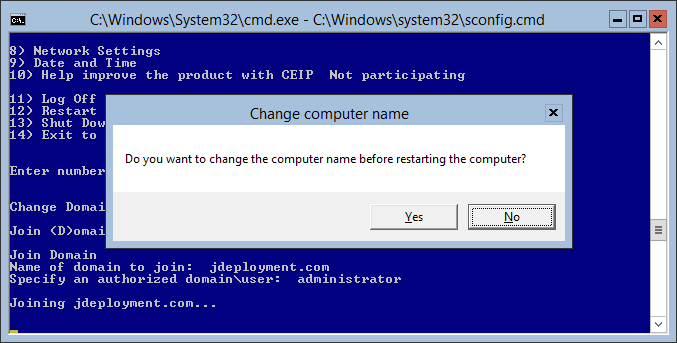 Being completely new to MS Server 2012, the “old” way of joining a domain was not cutting it. Thanks a million for this post. You are a gentleman and a scholar!